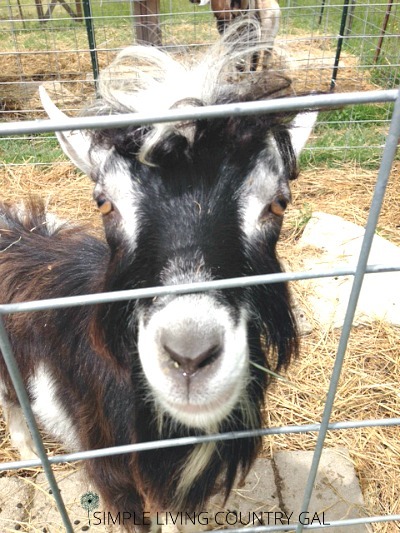 When people find out I raise dairy goats, I usually hear the following questions….You drink goat milk?? Raw goat milk?? Yuck, how can you drink that stuff? However, if you know the secret to delicious tasting goat milk you would be pleasantly surprised at just how amazing it does taste. Well, it’s easy. It tastes just like regular cow’s milk! Hubs used to be just like that. Actually, it took him 3 years to give my goat milk a try. He has been a drinker of goat milk ever since. I also hear just as many people say, I have had goat’s milk and it tastes, well, goaty. My answer to them is, IT DOESN’T HAVE TO! There are some easy and simple steps to take every single time you milk to ensure your milk is the freshest it can be. The most important tip I can give is to make sure you are milking in a calm and stress-free environment. Goats thrive on routine so having a system set up will go a long way to keeping your sanity and making milk time an enjoyable time for all. Step #1 Keep things very clean. I know this sounds like a no-brainer but actually, quite a few people skip this step. I make sure my mats are hosed down and set out to dry the night before. I use a different mat for each goat. I also sweep everything down and remove any cobwebs or dust that may accumulate during the day in a barn. Finally, the milk stand is sprayed with a mixture of bleach to help keep any flies away. Step #2 Make sure your goat’s udder is completely clean AND dry. When goats sleep just like us they like to lie down and stretch out. Unfortunately, they don’t really look before they lay. Soiled bedding is just as comfy to a goat as clean so there is no telling what is on those udders of theirs. Before you milk, take the time to thoroughly wash and dry your goat’s udder. Warm soapy water is all you need to do the trick. Use a fresh rag for each goat to keep the risk of spreading any germs to a minimum. Another perk of washing is that messaging with warm water helps to promote milk flow making the milking process much easier. I also believe it calms the doe before milking as well. If you have a goat that is pretty tentative on the stand a nice warm massage and a few calming words will help make her and you more comfortable. Step #3 Never milk into plastic. 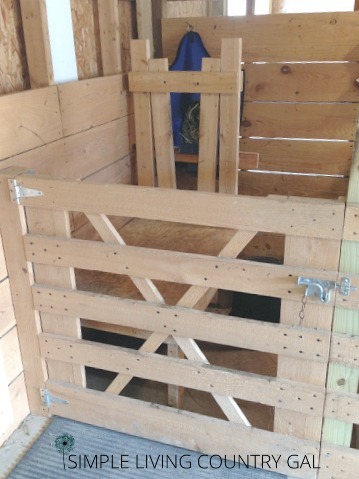 Plastic has a tendency to absorb odors, even barn odors. More often than not if someone tells me they have a problem with poor tasting milk it is because they are milking into plastic Instead try using a stainless steel milk pail like this one. I used to use my pampered chef glass pitcher but I was uncomfortable using glass for obvious reasons. 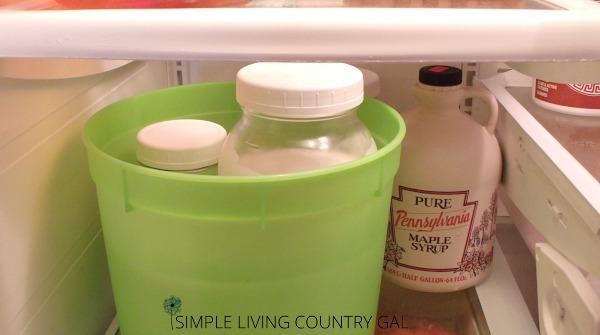 This pail has a very large opening which makes milking a breeze and comes in different sizes. If you have more than one goat to milk I suggest pouring your milk into individual mason jars. 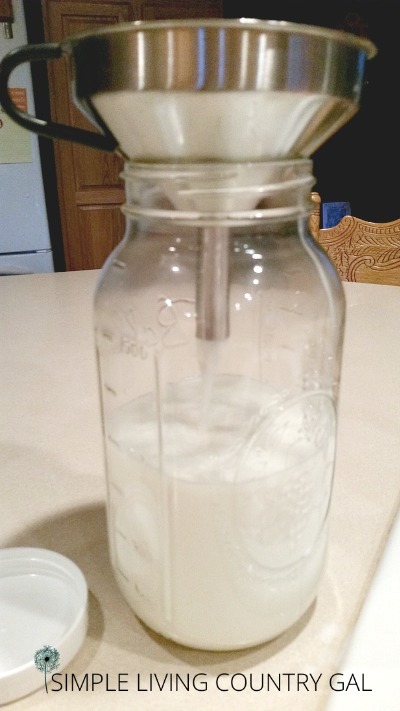 Mason jars are also helpful for keeping track of just how much milk you are getting from each of your does. Label the lids and keep records so you know if any problems arise. FYI: If milk production drops unexpectantly, something is up. Step #4 Keep your containers cold. This is by far the most important step in milking. If you have milk that tastes funky it just might be because you are not cooling it fast enough. 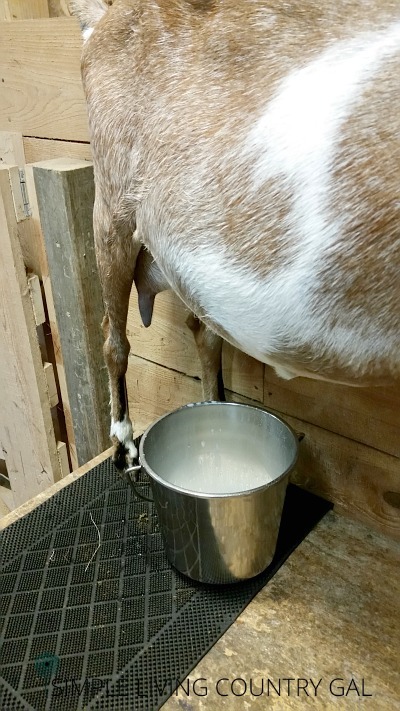 Goat milk is warm when it first comes out of the udder so you need to get the milk down to 38 degrees as quickly as possible. The easiest way to do this is to pre-freeze your mason jars by keeping them in the freezer overnight. In the morning put those mason jars into a cooler with a few ice packs. 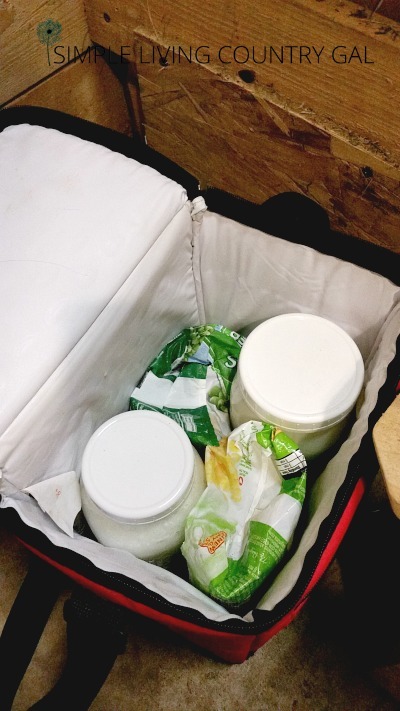 As soon as you are finished milking your first goat pour the milk into one of your chilled mason jars and return to the cooler with the ice packs. This will begin the cooling process immediately. Remember the quicker you chill things the better. Ninja Tip: Do all of your barn chores prior milking, that way when you are finished milking your goats you can take the milk immediately into the house to filter and chill. Also, I like to use frozen peas or corn in my cooler. They are flexible and easy to mold around the jars. At just a dollar a bag they are pretty durable. Once the bags rip you can give those veggies to your chickens as a treat. Step #5 Filter your milk. The first thing I do when I return to the house is to filter my milk into fresh jars. I found these great 1/2 gallon jars online. No matter how clean you start out, hair and dust will get into your milk so this step ensures you will have clean milk all the time. Also, make sure to use a stainless steel funnel. Plastic absorbs odors so I would not use it at all if you can help it. 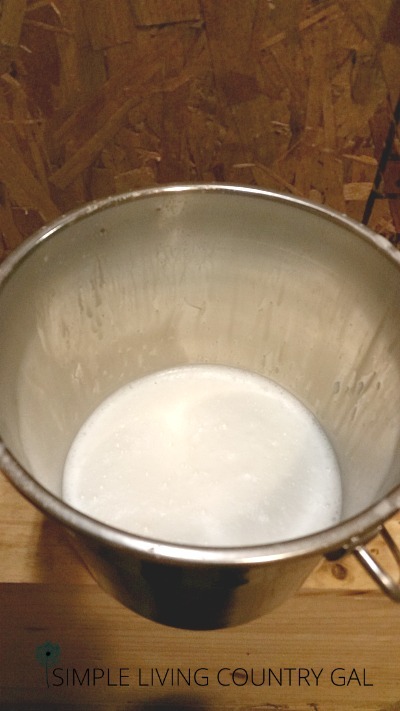 Step #6 Get your clean milk into an ice bath immediately. Remember the key to great tasting milk is ice cold quick. By keeping an ice bath in your fridge you put your fresh milk inside to finish the cooling. This tip really gets that milk to the key temp quickly. Are you seeing a trend here? Cold milk is delicious milk! Step #7 Keep your bucks at a distance. If you have bucks on your property you know all about rut and the pungent odor that comes with it. If your bucks are in rut, make sure they are downwind so that odor does not seep into the milk. Remember goat milk will absorb the smells around it so it is important to eliminate as many of those smells as possible. Step #8 Be careful what you feed the ladies. I remember one time I learned garlic was great for goats. So I took a bunch of cloves and fed them a handful. Want to guess what happened? Yep garlic flavored goat milk. I learned that what goes into a goat will defiantly come out in your milk! Ninja Tip: If you feed kelp to your goats and find that your milk tastes off, you may want to remove the kelp to see if it is the culprit. Sometimes the kelp can affect the taste of the milk but not always. I had an Alpine goat who’s milk tasted just awful. After trying several different things a friend suggested removing the kelp. Yep, that was the problem. Learning to handle your goat milk the correct way is the key to fresh and wonderful tasting milk. Follow these steps and you will be a lover of goat milk before you know it! I tried the whole pail thing and found it was much easier to just milk into quart mason jars. I use the rims to keep coffee filters in place (no hair or dust in my milk! ), although you can’t screw the lids on too tight or they balloon up. I get to keep each does milk separate (makes it easy to tell if something is going wrong before you find it in the strip cup because the milk will taste different before you see it), and I get a good idea of how much milk each is producing without having to measure or weigh anything. When I am only milking one goat I also milk right into a mason jar. I have found it much easier to use the bucket when milking multiple goats. I pour the milk into mason jars with the goat’s name written on the lid. That way I know who gave what milk. I love how you use the rims to keep the filters in place, I will have to use this tip! We freeze water in bottles and put two in the pail and milk over them. Instant chill. Bottles are always washed and put back in freezer for next milking. Always use stainless pail. Love goat milk. Thank you so much for sharing this post on Our Simple Homestead Hop! This spring we will be adding Nigerian Dwarf goats to our homestead and I need all the tips I can get! I’m beyond excited and think I’m driving the hubby crazy! Oh, I am so excited for you! Your life will never be the same once you start your adventures with goats! I have tried to use coffee filters and they are okay in a pinch, but they just aren’t sturdy enough if you are milking more than a couple goats. The disk filters I use are $5.60 for 100 which comes out to less than 6cents a filter. I use the same filter for all goat’s milk at each milking. If you are only milking one or two goats the coffee filters should work just fine. 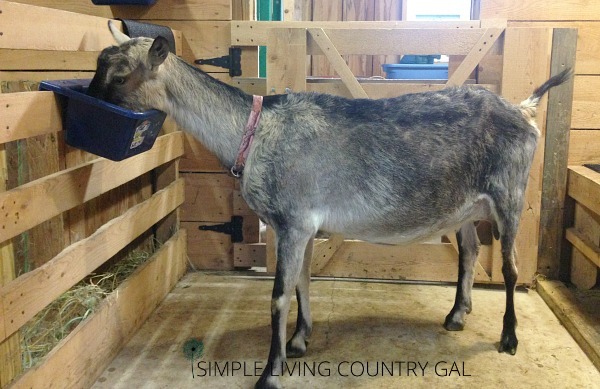 What do you feed your goats to get the best tasting milk? I feed a barley and oat mixture that I soak in water and ACV (apple cider vinegar). I then mix in BOSS (black oil sunflower seeds) and supplement with herbs.